Stourhead has its own grotto as well, built in the eighteenth century. The English of that period showed their affection for Italian garden design, even in the rocks of a grotto. Italian garden design was important to the English, just as the English design became important to American gardeners in the nineteenth century with the help of the seed and nursery industries. It still is today. 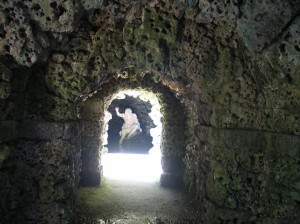 Inside the grotto at Stourhead. 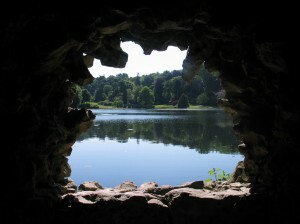 View from in the grotto at Stourhead looking at the lake.